Ezequiel Campa’s new special, En Vivo En y La Hierba will be released by Comedy Dynamics on January 15, 2019, premiering on iTunes, Google Play, Microsoft Xbox, Vimeo, and major cable and satellite providers. 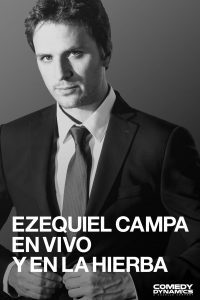 Argentine comedian Ezequiel Campa explores topics about his family life from his depressed mother who brings everyone in to her depression, to growing up with a father who is so cheap that he had to share his birthday with another child in the neighborhood. En Vivo y En La Hierba also touches upon issues such as sexism in Latin America, the death of romanticism and how, unlike Latinos, people in the United States throw things away even if they’re not broken. Ezequiel Campa is one of Argentina’s top comedic exports, starting his comedy career in 2003 and becoming one of the first Argentine comics to tour across South America and the United States. Ezequiel was featured in the 2015 New York Comedy Festival and was selected twice for episodes on Comedy Central’s Stand-Up en Comedy (2016 & 2017). The comedian/actor has also starred in the prominent Argentine TV series Guapas on Canal 13, as well as hosted a late-night talk show on Chile’s Via X TV (2013). “I can’t wait to release my special worldwide on the Comedy Dynamics Network!” said Ezequiel Campa. “Ezequiel’s engaging brand of comedy resonates throughout Latin America, as laughter is truly a universal language,” said Brian Volk-Weiss, CEO of Comedy Dynamics.